If you haven’t done so already, I encourage you to read Andy Hall’s analysis of the DeWitt-Weeks saga. I tend to agree with Hall that there is no reason to believe that Ms. DeWitt’s goal is to intentionally mislead her young readers or distort the history covered in her book. However, as we now know she is, in fact, doing both. I am not familiar with the rest of Kevin Weeks’s books in the Street Series collection, but I have no reason to believe that these books are inappropriate in any way. It just so happens that the subject of Entangled in Freedom has been on my radar for quite some time and for very good reasons. I’ve been just as critical with white proponents of this myth as I have with African Americans. That said, I don’t mind admitting that I am much more disappointed when the target of my criticism is black. Let me explain. As all of you know my primary interest in the Civil War and American history generally is centered on questions related to historical memory. Much of that interest revolves around the broad subject of slavery and race. My recently completed manuscript on the Crater focuses on how Americans chose to remember – or in most cases forget – the participation of black Union soldiers in the battle and my new project will address the evolution of stories related to the black Confederate narrative. As a result of my extensive reading and research into these areas I would like to think that I have some grasp of the challenges associated with correcting /revising a collective memory of the Civil War and broader historical narrative that up until recently either ignored the subject of black history or included a grossly distorted version of it to suit the political and racial agendas of certain groups. We can see this at different points in our history from the Dunning School in the 1920s and 30s to the continued hold of the Lost Cause narrative and its imagery of loyal and contented slaves. I have nothing but the highest respect for those black historians such as John Hope Franklin, who worked tirelessly to correct this racist narrative and ultimately inspire countless others to continue to research topics related to the history of race and slavery in America. Let’s face it, it’s only in the last two decades that we’ve seen significant changes to textbooks and other curricular materials used in classrooms across the country. We should never forget what it took to bring this about. And we should not forget that it took the hard work of both black and white Americans. In November 2007 my wife and I were invited to take part in a very special tour of Fredericksburg with John Hennessy and David Blight. Blight’s most recent book included two recently uncovered slave narratives, one of which was authored by John Washington, who lived in Fredericksburg. The tour explored various sites around the city related to his life. 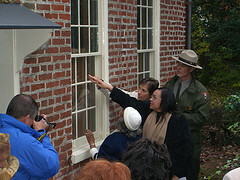 The chance to explore the life of a slave, who left us with such a rich narrative and with the guidance of two seasoned historians would have been enough, but the tour also included two descendants of Washington’s – Ruth A. Washington, granddaughter of Washington as well as his great-great granddaughter, Maureen F. Ramos. They had been contacted shortly before the tour and had never read or even heard of this narrative. At dinner that evening I had a chance to talk with Ruth about the day and it was obvious that she had gone through quite an emotional experience. The subject of slavery simply was not discussed around her dinner table and a connection was lost. In my own research on black narrative of the Crater I learned that many African-American families resisted keeping alive what they believed to be a painful and even shameful history following the Civil War. I do believe that given the historiography of African-American history and the broader history of race in this nation that blacks have a heightened responsibility to take care of their past. In saying this I am not suggesting in any way that there is no room for differences of interpretation. This, of course, is what any mature understanding of history includes. What I am suggesting is that we should expect a certain level of understanding that history is fragile and that it can often be used/manipulated for nefarious purposes. Again, while I do not believe that neither Ms. DeWitt or Mr. Weeks intend to distort our understanding of the past their narrative does nothing less than set us back to some of the worst distortions surrounding antebellum race relations/slavery not to mention everything we know about Confederate policies toward the recruitment of black soldiers and broader racial attitudes within the Confederate South. The difference between DeWitt and Weeks and H.K. Edgerton is that our authors still have every opportunity to correct their errors of history. I applaud their goal of wanting to reach out to young children with exciting narratives based in the past. At the same time it is hard to distinguish between the damage that will be done with this story as compared with this textbook that was used here in Virginia [and here] as late as the 1970s. The textbook in question was part of a state-wide revision of textbooks that was carried out in response to the civil rights movement and the desegregation of public schools. It clearly reflects the political agenda of the white establishment. African-American history has come a long way and has allowed us to fill in huge gaps in our understanding of American history. Let’s do everything we can not to set us back 100 years in our historical understanding. The history of race and slavery is indeed “the tough stuff of American history” but anyone who bothers to look at the recent historiography can see that it tracks increased cooperation and understanding between the races – goals that both Ms. DeWitt and Mr. Weeks no doubt value. Do you see it as a problem that you think that blacks have a greater responsibility to care for “their” history than whites? Does casting the creation of “memory,” and the recent “cooperation and understanding between the races” further entrench the dialectic of black/white that it seeks to overcome? What a great question, but one that I am not sure I can answer at this point. On the one hand I believe that both whites and blacks have equal responsibility to uphold professional standards of historical inquiry when relevant, but at the same time I am implying (perhaps unjustifiably so) that blacks may have more of an emotional connection to certain narratives. Perhaps, in the end, all I did in this post was reveal my own perceptions/bias regarding how blacks ought to approach the study of this history. I am going to have to think about this some more. Thanks for the question, Peter. I don’t think it makes any difference whether we’re talking about blacks, whites, gays, Jews, or blue-eyed left-handed red-haired women who own three-legged dogs. The sad fact of the matter is, the oppressed minority or the crime victim always has a greater responsibility for protecting the truth. Fairness has nothing to do with it. Unfortunately, it’s just part of being a member of the human race. Okay, I can’t think of any examples of blue-eyed left-handed red-haired women who own three-legged dogs being victimized, but maybe there’s a conspiracy afoot to keep them silent! mcvouty-well, it seems these days that the total absence of evidence that something occurred represents proof to some people that a conspiracy exists to suppress the truth. If man really went to the moon, there’d be a McDonald’s there by now. Or maybe there IS a McDonald’s there, and NASA is keeping it quiet because…I don’t know. But now I’m sure of it! This is a sad situation. It appears this well-intentioned woman wanted to write something which would have a positive influence on people, w/o stopping to think whether or not it might be the least bit historically accurate. This post, and your links to the Virginia textbook, underscore the importance of teaching our children the proper view of the Civil War, and American history more broadly. As a new father of twins, I look forward to ensuring that they are raised understanding our past, and I will be interested to see what they learn in school about the Civil War and other areas of our history. I’ve linked to a few of your posts, including this one, in the comments section. Thanks so much for providing the information on the textbooks. Perhaps I am remembering my education correctly! It is truly remarkable that even in a “Yankee” school, as late as 1981, they were still teaching what I recall as being a Lost Cause version of the War Between the States! My pleasure, Ronald. Thanks for the links. Apropos of Peter’s excellent point, I hope that we are all, regardless of our ethnicity, concerned about children, regardless of theirs. Having said that, it is somewhat troublesome to think that, for instance, female teachers would be expected to be more sensitive to the relative invisibility of women of achievement in our history texts. The dangerous flip side of that case, of course, is that we would understand if male teachers were not so concerned. “Entangled in Freedom” gives us a special laboratory for examining this question, as it appears to play into the hands of those who would have us believe slavery was a much happier institution for the enslaved than we have been led to believe. This has made me think hard about my own heart. I bristle much more at hearing a woman. talk disparagingly about working women than I do a man. I shouldn’t. I should hold foolish women to the same standards i hold foolish men, no? Thanks, Peter. Until verifiable documentation comes to light, I cannot understand why some African Americans are so keen on arguing the “Black Confederate” meme. Family recollections are one thing, but distorting the truth is another. Why does DeWitt’s book have an African American depicted in Confederate uniform? Is this a way of getting around the fact that black “service” really consisted of a continuation of slave (enforced) labor for the Cause? As an African American teacher of African American literature and culture, this type of “scholarship” used as historical fiction only makes our jobs that much harder.